Fonterra is on notice from its leading independent director, Sir Ralph Norris, that another food safety scare would have serious global implications. While it may be inaccurate and unfair, Fonterra is saddled with the melamine adulteration in China in 2008 and the DCD fertiliser concerns earlier this year, followed by the precautionary recall because of a botulism scare in August. 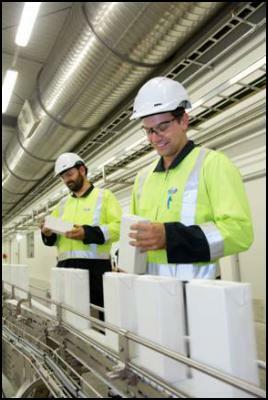 “That means it is important for Fonterra to learn from the whey protein concentrate events. The fact that the botulism scare was a false alarm doesn’t diminish the work of (our) inquiry,” Norris said. . .
Fonterra’s communications team is being renewed as public relations contractor Baldwin Boyle Group (BBG) makes way for more in-house employees. Five of the 33 recommendations made by the independent inquiry for the board concerning the botulism scare in whey protein concentrate are aimed at better communication. The first recommendation is that Fonterra needs to continue building a directly employed, strong, specialist, and experienced communications team. That should be done in key global markets, supplemented with contracted, high-calibre local expertise where appropriate. . .
For many decades, van Eeden Tulips was the only tulip bulb producer in New Zealand of any significance. For 45 years, it supplied most of the bulbs grown by commercial flower growers, home gardeners and council parks and reserves departments, before branching out into exports in the late 1990s. . . .
Low sheep returns and high milk prices have contributed to a rise in dairy farm conversions in Southland. New dairy farm conversions totalled just seven for the 18-month period to July. But a recent spike in new conversions comes after Fonterra announced its record forecast payout of $8.30 per kilogram. Environment Southland consents manager Stephen West said there had been more dairy farm conversion applications in the past four months than there had been in almost two years. The surge in conversion numbers also coincides with the plan change 13 deliberations drawing to a close. Plan change 13 has required all new dairy farms to obtain a resource consent before becoming operational since April last year, and the decision on whether the rule will become permanent will be made in December. . . .
Shareholders who packed out the Alliance Group Ltd roadshow meeting in Oamaru last week were told they are not getting a dividend. Chairman Murray Taggart, an Oxford farmer who has taken over since Owen Poole retired on September 30, said times had been ”tough for meat processors and exporters”. The equity ratio and operating cash flow were good, but not sufficient for a dividend. . .
Fonterra Co-operative Group Limited has acquired a 6 per cent shareholding in Australian dairy company Bega Cheese Limited. The 9.3 million shares were purchased at AUD4.95 per share for a total cost of AUD46 million. Fonterra Chief Executive Theo Spierings said, “Australia is an important market for Fonterra, and we are committed to growing our already strong presence. “There has recently been a lot of consolidation activity in the Australian dairy industry. It is important that Fonterra participates, and we have confidence in Bega and the strategy it is pursuing,” said Mr Spierings. . . The Overseas Investment Office (OIO) has approved the application by a Singaporean investment management company to buy half the shares of New Zealand Pastures Limited, a locally-owned company that operates seven South Island sheep and beef farms. The farms :Three Rivers, Grantham Springs, Hitchin Hills, Quailburn, Hills Creek, The Styx and Huntleigh, cover almost 23,500 hectares. Singapore company Duxton Asset Management is buying the shares on behalf of itself and two other overseas investment funds. . . . When his mates got wind John Hough was making his ”last stand”, they thought they would go along for the ride. The Rakaia shearer and Shearing Sports New Zealand official who will only admit to being ”not 70 yet” began shearing at 18 and first competed in open-class shearing 40 years ago. . . .
#gigatownoamaru appreciates its rural hinterland. More than half of Otago small and medium-sized enterprises (SMEs) receive business income from the rural sector.Kiwibank group manager business markets Mark Stephen said with New Zealand’s agricultural sector economic growth lagging in the three months ended in June, the drought had squeezed the sector. Even those small enterprises which did not directly deal with the rural sector were found to be supplying customers who did deal directly with farmers. . .
An irrigation project taking Waitaki River water further into South Canterbury is gathering momentum. The Hunter Downs Irrigation Scheme has been awarded $640,000 from the Ministry for Primary Industries’ Irrigation Acceleration Fund. It will help pay for engineering design, an investigation into demand from landowners, and a fundraising prospectus. ”This part of South Canterbury has regular droughts,” Irrigation Acceleration Fund manager Kevin Steel said. ”The HDI Scheme is a large-scale infrastructure initiative that hopes to significantly address this problem. ”Where agriculture is New Zealand’s largest export earner, irrigation infrastructure contributes significantly to supporting the country’s ongoing economic growth.” . . .
Immigration New Zealand is to work with Canterbury-based irrigation companies to get more specialist workers into the country to fix storm- damaged irrigators. Last week, Irrigation New Zealand said the wind storms which ravaged the region had caused ”unprecedented” damage to more than 800 irrigators. Irrigation NZ chief executive Andrew Curtis said machinery from South to North Canterbury had been damaged by high winds but the bulk of the damage was to machinery around Ashburton, Selwyn and Waimakariri. ”It’s very, very serious,” Mr Curtis said. . .
Kiwi ingenuity combined with forensic science techniques has produced a method of identifying individual possums that has the potential to also be used in the fields of environmental and human science. Dr James Ross from the Centre of Wildlife Management and Conservation at Lincoln University is using a locally-developed, activity interference device (WaxTag®) baited with attractant substances to identify individual brushtail possums biting the tags. In the absence of an efficient and cost-effective alternative to estimating the abundance of possums after control methods have been applied, the residual trap-catch index (RTCI) remains the monitoring standard at present. However, RTCI is not sensitive in locating survivors when the population is at very low densities and it is costly because traps need to be checked daily. . .
Lincoln University PhD students Laura Buckthought and Travis Ryan-Salter have been awarded $10,000 each as the first recipients of the new Alexanders Agribusiness Scholarship. The generous scholarship is exclusive to Lincoln University and awarded on behalf of Alexanders Chartered Accountants who created the scholarship with the aim of helping committed, high calibre postgraduate students undertaking research in the primary sector. The company Directors did consider opening the scholarship up to students from other universities, but chose to make it exclusive to Lincoln on account of the University’s focus on the land-based industries relative to New Zealand’s key commercial interests. . .
LONDON, Ohio — They’re just typical farm kids. They’d rather run the combine than the truck during wheat harvest, and they love to run their six-row Kemper chopper they call the Beast Machine. Their first chore was throwing flakes of hay bales to the cattle on their feedlot, and they remember when their dad let them drive the tractor in first gear, inching down the feedbunk while he tossed feed to the cows — “I know it was before I was even in school!”. Their idea of dressing up is something other than an old T-shirt with the sleeves cut off. They hate going out in freezing weather to break up the ice on the waterers for the cows, or cleaning up the outdoor feed bunk after it rains. They post pictures of newly cut alfalfa or eartags on Facebook. . . In Holland the first beef burger without disturbing a cow has been eaten, globally governments intend to ban smoking and, in New Zealand, a soil scientist is campaigning to outlaw the plough. World authority on soil science, Dr John Baker, says ploughing or conventional tillage contributes to global warming, crop failure, soil erosion and eventually famine in areas of the world. Ploughing is like invasive surgery. It releases carbon into the atmosphere which add to global warming and depletes the micro-organisms which enrich the soil. Over time tillage leads to soil erosion, crop failure and drought. Dr Baker, who has a MAgrSc in soil science and Ph.D in agricultural engineering from Massey University, says the single greatest challenge facing the world today is feeding the extra 50 percent population by the year 2050. . . When it comes to farming, Barrie Wills is an advocate for striking the right balance between conservation and production. Brought up on a Timaru farm and now living in Alexandra, Dr Wills has spent more than 30 years as a research scientist. He was initially involved with soil conservation control under the then Ministry of Works and Development water and soil division, and then pastoral management, revegetation and erosion control in semi-arid and high-country environments under Landcare Research and AgResearch, until 2004. . . .
Annabel Taylor feels privileged to serve the rural community. As a paramedic based at Taieri, Miss Taylor (36) works for both the Otago Regional Rescue Helicopter and the Dunedin St John ambulance service. She was recently awarded a $3000 Rural Women New Zealand/Access scholarship, which will help cover her expenses while she studies for a year-long postgraduate certificate in specialty care, advanced paramedic practice, at Whitireia Polytechnic in Porirua next year. . .
A Ministry for Primary Industries (MPI) spokesman says the ministry has been using various means to educate backyard pig farmers about their biosecurity obligations and the precautions they must take before feeding food waste to pigs. MPI import and export animals manager Howard Pharo was responding to questions put to the ministry last month by Courier Country and raised by New Zealand Pork Industry Board chairman Ian Carter and lifestyleblock.co.nz website editor Kate Brennan. . .
Greenshell New Zealand proved just how strong its mussel business is at last week’s American Chamber of Commerce DHL Express Success & Innovation Awards, scooping up two prestigious awards. Held at the Pullman Hotel in Auckland, the family-owned business was recognised and rewarded for exports of its innovative products under the award-winning Ikana brand. Presented by Prime Minister John Key, Greenshell New Zealand won both The Exporter of the Year to the USA Award from the $500,000 to $5 million category and The Supreme Award 2013. . .
A Rotorua man has been sentenced to 200 hours community service after pleading guilty to paua poaching charges. On 31 July 2013, 34 year old unemployed man Raymond Major appeared in the Rotorua District Court on charges under Section 232 of the Fisheries Act 1996 relating to the illegal sale of paua. Major was initially identified after offering both Paua and Kina for sale through his Facebook page. A Fishery Officer was then deployed to make contact with the defendant and arrange to buy seafood from him. . .
New Zealand dairy farmers and milk processors need robust business structures to withstand market movements, Hayley Moynihan says. Delivering a keynote address at the South Island Dairy Event in Lincoln on June 24, the Rabobank food and agribusiness research and advisory senior dairy analyst said milk price volatility was not going away. We needed to aspire to where there was opportunity to enter more lucrative markets. Rising consumer expectations were presenting a continuing challenge, Ms Moynihan said. . . .
Federated Farmers is applauding the way Waikato farmers have embraced Agrecovery rural recycling. A record six tonne of hazardous horticultural, agricultural and veterinary chemicals was collected during the Waikato regional collection, finishing last week. “Farmers are choosing to dispose of their chemical waste responsibly due to the convenience of the service,” says James Houghton, Federated Farmers’ Waikato provincial president. “It is great to see increasing numbers of farmers using Agrecovery. It is another example of farmers changing their behaviour and working for the good of the environment without the need for legislation. . . Wet and warm springs and summers are keeping rabbit numbers down across Canterbury. Environment Canterbury biosecurity team leader Brent Glentworth said for the past two seasons warm, wet weather during the first rabbit breeding cycle had been largely responsible for keeping the population in check. Young rabbits had a low survival rate in those conditions because they succumbed to pneumonia or coccidiosis – a liver disease ”very prevalent” in warm, wet weather, Mr Glentworth said. . .
Irrigation companies in the Waitaki river catchment are facing significant clean up bills after last month’s flooding damaged irrigation schemes. Waitaki residents say the rain and flooding from the storm which lashed the country was the worst seen in decades. The Danseys Pass bridge was destroyed after about 160mm of rain fell in the space of three days. Maerewhenua District Water Resource Company chairman Kelvin Weir said the scheme had been ”very lucky” and ”survived pretty well” considering the amount of rain and high river flow. . . . Easier access to water in Canterbury is not only fuelling dairying production but also a significant growth in the production of potatoes and onions. The 2012 agricultural production census, conducted by the Department of Statistics, shows the Canterbury potato harvest accounted for half the national harvested area in June 2012. And, the land put into onions increased from 690ha in June 2007 to 1040ha in June 2012 – about a 50% increase. . .
ASB has confirmed it is a new gold sponsor of the Dairy Women’s Network (DWN). The partnership, which took effect on 1 July, will boost the work already being done by the DWN to improve the financial literacy skills of the country’s dairy farming women. DairyNZ modelling shows there is an opportunity to improve the industry’s profitability by more than $1B per year, or approximately $1000 per hectare, by improving financial literacy and management capabilities. The industry body has also identified there is a significant range in profitability between dairy farmers, with a contributing factor being management capability. . .